The first Nancy Drew books were action-packed adventure stories ghostwritten by the first woman ever to receive a masters of journalism from the University of Iowa in 1927. Mildred Wirt Benson (under the pen name "Carolyn Keane") still remains an unsolved mystery, but it's obvious that she lived in a different world. Benson practically fell through time, according to Wikipedia, living for 97 years, from 1905 to 2002. And though she didn't write Password to Larkspur Lane, she is responsible for the The Mystery at Lilac Inn, which is often cited for another unfortunate anachronism in the original Nancy Drew series - racism. By the 1950s Mary Mason's simple getaway car had become an elaborate two-man submarine, and jewel thief Mary was transformed into a spy for a massive foreign espionage ring - presumably reflecting anti-communist Cold War tensions. But the changes also stripped away much of the gritty personality from the characters, reducing them to the bland action-hero stand-ins we know today, and making them more suitable for an ongoing series of massively-franchised children's books. 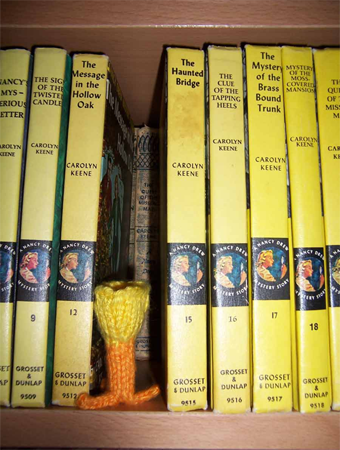 In the original books, the Nancy Drew character was much more realistic, which explains the impact she had on earlier generations. USA Today even reports that on the Supreme Court, all three female justices cite that original Nancy Drew as an influence - Sandra Day O'Connor, Ruth Ginsburg, and Sonia Sotomayor. Don't let anyone tell you how to behave - no matter what decade it is! This post originally appeared on the blog 10 Zen Monkeys. Republished with permission.